5 religious extremists have been arrested in connection to the murder of a lady evangelist in Kubwa area of Abuja earlier today. 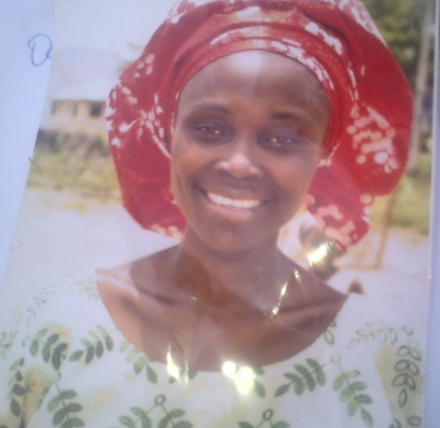 The victim, 42-year-old Eunice Elisha, the wife of Pastor Olawale Elisha of RCCG Divine Touch Parish in Kubwa was hacked to death by some suspected extremists while preaching the gospel in Gbazango West area of Kubwa around 5:30am today. Her killers reportedly left her in the pool of her blood with her megaphone, bible and cellphone. Area resident said the deceased is a lovely woman who had been preaching in the area in the past 16 years. Earlier today, residence heard her voice as usual but few minutes later, they heard her screaming blood of Jesus repeatedly before her voice died down. She was later found in the pool of her own blood. Pastor Olawale Elisha who looked dejected expressed shock today over the brutal murder of his wife of many years and the mother of his seven children. The corpse of Eunice Elisha has been deposited in a mortuary in the area. Meanwhile, police have arrested 5 Muslim youths fingered in the brutal murder of Mrs Elisha. May her gentle soul rest in the bossom of the almighty. The wrath of God must surely fall on those uncircumcised abokis. Killing innocent woman for preaching the word of God is barbaric and unacceptable. U can’t force everybody to join ur blood thirsty religion! Religion that derives joy in killing innocent people, if this is what islam is all about then I spit on ur islamic religion. We have the christians hindus, the Buddhist etc. Non is as violent as islam shame on u pipo! Blood sucking vampires. Oh my God Yet another one again! so many atrocities being committed under the guise of religion.Religion is bane of our nation. Both 2 main religions are at logger heads,either one claiming moral higher ground. This type of incidents will continue if we don’t learn to be tolerant of other people’s way of life.On paper Nigeria is a secular state but the reality is different. Most people don’t respect the law of the land ,they put their religion above everything else and so we have confrontation at every opportunity which then leads to catastrophe. Religious believe is personal relationship with one’s God, it is not to be forced or coerced on other people.i get a feeling going by the timing of the incident it clashed with the early morning prayer of the muslims, probably they were on their way to mosque when woman tried to preach to them and trouble ensued. What a sad state we are in many people claiming to be whiter than snow but yet so much atrocities every where.Lawlessness is the underlying factor in all of this. I hope the 5 arrested are the real culprit . they must get their just deserts. Very sad. R I P to the deceased. rest in peace evangelist.those behind your death will never know peace.they ve been shedding innocent Christian blood all in the name of religion.God almighty will surely deal with them and the peace of the Lord will be far from them just as it is far from those that kill for religion sake. Justice will surelly prevail, the wrath of God will be on those responsible. May her soul rest in peace. This is very sad. When is this act going to stop? Why would these bastards kill someone preaching the gospel? Justice must prevail! Whosoever might have done this shall have no peace. The wrath of God will visit them all. WHAT ARE THEY STILL DOING IN D NORTH ???. RUN FOR UR DEAR LIFE !! !.D BIBLE SAYS – GO INTO D WORLD AND PREACH D GOSPEL AND TO D GENTALS AND TO D JEWS , BUT IT STILL SAYS ,IF THEY DID NOT ACCEPT YOU , DUST UR FEET IN D HOUSE /LAND AND LEAVE . SEE HOW THESE BLOOD SUCKING DEMONS HV DELIBERATELY MURDERED THIS GOOD WOMAN AND RENDERED HER 8 CHILDREN MOTHERLESS ?. MY PROBLEM IS THAT D USELESS YOUTHS WILL BE RELEASED IN LESS THAN 48 HRS LIKE D OTHERS BUT IF IT,S NIGER-DELTA AVENGERS OR BIAFRA FREEDOM FIGHTERS , THEY,LL DETAIN FOR LIFE , THEN YOU,LL SAY WE ARE ONE NIGERIA . HOW ???????????????????????????????????????????????????. Amanda Amuda, come and defend your religion’s members that they are mere criminals and didn’t do it for religion. This barbaric act must stop. For the fact that someone don’t practice same religion with u didn’t make him or her an infidels as those self saints call it. Peaceful religion don’t act this way. Jesus Christ didn’t teach Christian this. Ever & ever Christianity isa religion of peace. The perpetrators wl definitely be brought to justice. However, the christians too should learn not to cause trouble with their preaching. l av encounter such preachers on several occassions. One even went as far as telling me i wl go to hell fire as a muslim for not accepting Jesus. I just took time to explain to her that as a muslim i know Jesus more than she probably does wt evidence from the Quran without bothering to add that it is stated in the Quran also that whoever heard about Muhammed without believing in him too wl never enter paradise. That is because i av proper understanding and sane mind. Some people wt mental disorder may not find it funny. May God have mercy on us all. may her soul rest in peace. what a cruel way to die. What a life! This is what this lady has been doing for the past 16yrs. And you people say that Nigeria is getting better. It is actually getting worse and there is no way we can continue like this as a nation. Let there be a permanent irreversible separation into 3 regions of the nation Nigeria . If on the other hand after such separation a person from one nation decides to live in another country then international law shall be in place and that thing is in contention (power, position, religion etc) will nolonger be contended about. But as for my sister that is murdered let the God of justice recompense her killers for I know that the power that we have to deal with will only whitewash the matter because her killers are doing the biddings of their masters in Authority, that is already there to protect them. My brethren in the North my take is please if it will be possible for you pls relocate back to east and the west or is it not better you come back with your lives intact than that they keep bringing your corpses home. He that has ears let him hear. hello guys, thats ONE NIGERIA for you. God what is wrong with these foolish fake Muslims killing in the name their stupid fake *****. Please can a real believers of islam clear me if the Quran stated that any one that is not a Muslim should be persecuted.if it written matter close ,believe me it’s satanic. Murdered for preaching the word of God. My heart goes out to the entire family most especially the children. If this is what Muslims call religion of peace then God will reward all of you bunch of idiots with the same and you all will never have peace either. SISTER YOU DIED PREACHING AND SPREADING THE WORDS OF GOD,I HAVE FULL CONFIDENCE YOU ARE IN HEAVEN AND ON THE RIGHT HAND SIDE OF THE MOST HIGH GOD. MAY YOUR SOUL REST IN PEACE AMEN!!!!! mama, you dont need to run for your life.nigeria is one country.there are christians all over naija. my dear sister, your killers will never know peace.may our almighty GOD arrest them IJMN AMEEEEEEN.MAY YOUR GENTLE SOUL REST IN PERFECT PEACE WITH THE LORD TILL WE MEET TO PART NO MORE AMEN. What a glorious way to go home! May you not loose your reward in heaven in Jesus name. As for the family she had left behind, may the good Lord comfort them and be with them all. As for the killer Oh Lord have mercy on them and let them come to repentance and salvation of the Lord so they will not die in their sin and go to hell fire. They want war, they should be prepared. We christians hv tolerated you muslims in the name of brothers and sisters, as jesus did wit pple dat were referred to as infidels bt i say no more brotherly love again. Your pple who u refer to as illiterate kill us and you illiterate sit dwn nd condem dem bt if sme1 says against Allah, u chop of their hands without tinkin twice. Shame on islam bcos islam cant control its pple nd claim 2 be holy. SHAME ON YOU PEOPLE!!!! if u pple wnt 2 islamize Nigeria, go ahead,for we hv learnt from u infidels nd we cnt trust u pple. We r biafrans 2 d last nd we will neva eat wit infidels. To other tribes in Nigeria, dis is a wake up call to u all. Sme pple will stip so low 2 support dis govt, wch is runned by islam bt hv gotten wat God hs promised us, wen he said we will rule nd nt be ruled. Brothers nd sisters in christ, prayer witout wrk is useless. As we pray, we hv 2 defend ourslfs nd generations after us,as God in heaven strengthens our hard work. Anybdy dat say Nigeria will be one is a lier, 4 d bible has said it in revelations, dat kings will fight against kings, nations against nations bt does who r steadfast in Jesus name shall be saved. We all agree the end is coming, which is written in revelations bt hw mny of us kw d content is the scriptures? To all muslims, in one simple sentence,”IF YOU WANT WAR,WE CHRISTIANS SHALL GIVE YOU IN FULL, THAT YOUR GENERATIONS SHALL EAT OF IT AND THEIR GENERATIONS AFTER THEM. To the family of the late evangelist, as u mourn, also smile and thank God, for your wife died in the service of God and her reward shall be greater in heaven, Amen. NIGERIANS,WAKE UP, FOR OUR REVELATIONS HAS ALREADY STARTED!!! God will surely reward these evil people with the same coin. My the gentle soul of our beloved sister rest in peace.You blood sucking demons parading yourselves as religious extremists, I am a christian and from a home where there are both Christians and Muslims. I have realised over the years that my brothers and sisters who are Muslims are peace lovers. The Qua ran preaches peace, which ever modified version of the Qua ran you have wrongly interpreted to be killing Christians must be from the pit of hell. Repent today or hell awaits you. Demons!!!. Thanks 4 ur objectivity @peacemaker. To butress ur point a pastor in Enugu used some Muslims, hausas to be precise for ritual to lay foundation of a church building and was caught. This blog also carried the news sometimes early thid year. Shall we as a result of that tag all Christians evil? Evil ones are all over irrespective of religion. Writing inciting statement or spreading hatred amongst ourselves is not the best. May all the evil ones be punished both on earth and the hereafter. Christians wakeup and takeup ur responsibilities. Jesus did not ask paul to through away the sword but ask him to pucket it back. Now is the time for the sword to perform it work and it must be now. may her soul cry out for help by the killers and God help them to come out and testify that they kill her.